Dietary fiber, originating in plant tissue, is indigestible. Although it has no calories and no nutritional value, fiber in the diet plays a tremendous role in preventing disease and maintaining good health. As fiber is consumed and passed through the body organs, it acts as a sponge, absorbing many times its own weight in liquid. This causes the feces to become soft and bulky and more easy to be expelled from the body. This quick passage through the intestines and out of the body is important, as constipation is a source of discomfort and the beginning of many illnesses. The fiber also acts as a buffer against colon of the cancer as if reduces the contact that the toxin-filled feces has with the walls of the colon. Likewise, it is believed by some scientists that the increases liquid-content of high-fiber stool will be effective in diluting carcinogen-causing agents. There are two types of fiber. Soluble fibers dissolve quickly and become sticky as they dissolve. They include pectin, which is found in fruits, legumes, nuts and some vegetables. Some soluble fiber can lower blood cholesterol levels which will, in turn, reduce the possibility of heart attacks and heart disease. The addition of soluble fibers in the diet should be coupled with the decreased intake of fat to be effective. Soluble fibers can also help control blood sugar levels in individuals suffering from diabetes. Insoluble fibers are found in bran, vegetables and whole grains such as brown rice and whole-wheat bread. Insoluble fiber is important for moving bulk through the intestines quickly and also helps to control the pH level in the intestine. This action alleviates constipation by producing regular bowel movement. Although it is important to include an adequate amount of fiber in the diet, it is not recommended to take huge fiber supplements on a regular basis. Fiber pills are also not recommended as they lack the nutrients naturally found in high-fiber foods. Too much fiber can be the cause of bloating, digestive problems and intestinal gas. Excessive fiber can also lead to zinc, iron and mineral deficiencies. Become knowledgeable of which foods are high fiber and begin to add them slowly to the diet. The skin of fruits and vegetables can be scrubbed and eaten to increase fiber intake. Vegetables should not be boiled, but rather eaten raw or lightly steamed. Eliminate products with white flour from the diet completely. 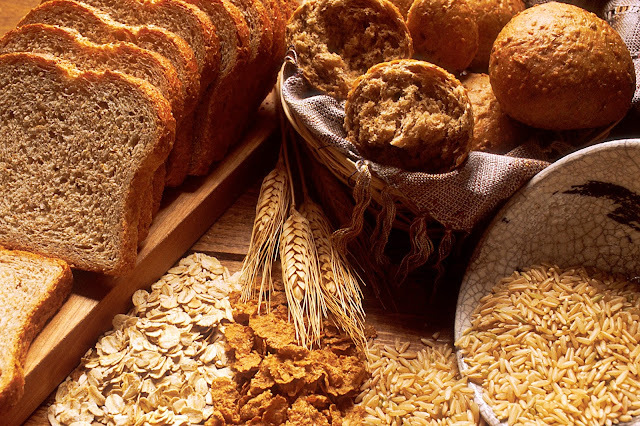 Instead consume whole-grain cereals and breads and brown rice. Eating fiber can be helpful when trying to lose weight. It provides a feeling of fullness that will help reduce hunger. Using fiber for diet or weight control can help with overall body tone because extra water is also being added to the diet. Be sure to include enough protein and fat with each meal to ensure a balanced diet.